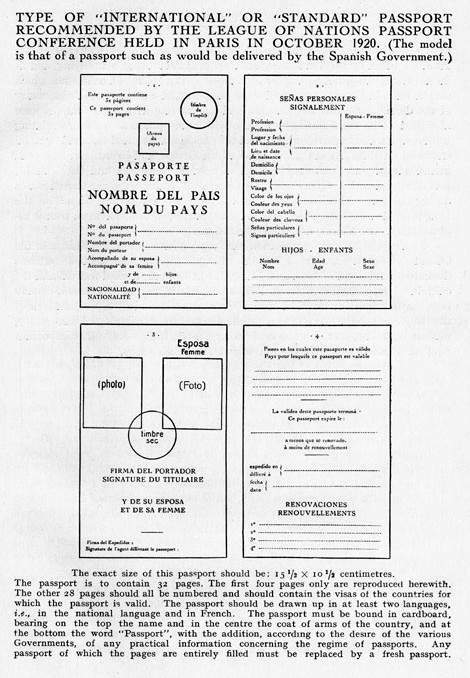 The League of Nations held two conferences about passports. Below you see their recommendation of a “passport standard”, further the handling of territorial issues. British Mandate over Tanganyika Began The British government officially began their administration over the German East African mandate and changed the name of the territory to Tanganyika. The British sent the German settlers home and sold off their estates and property. Schleswig Northern Zone Plebiscite. Voters in the northern zone of the North Schleswig plebiscite (74 percent) decided for reunion with Denmark. Allied Occupation of Upper Silesia. Due to fighting between the Germans and the Poles, the Allied Commission of Control took over administration of Upper Silesia with the support of French occupation troops. Allied Occupation of Memel. Allied forces occupied the Memel district and placed the port under Allied control. League Administration of the Saar. The League of Nations took over the administration of the Saar from Germany for fifteen years. At the end of this period, the League would hold a plebiscite to determine the future of the region. Schleswig Southern Zone Plebiscite. Voters (80 percent) in the southern zone of the North Schleswig plebiscite chose to remain part of Germany. Danish Administration in North Schlesvig The Danish government assumed control over the northern zone of North Schlesvig, which had voted for reunion with Denmark in the plebiscite. Incorporation of Northern Schlesvig into Denmark The Danish government officially incorporated the northern zone of North Schleswig into Denmark in response to the plebiscite of February. Reorganization of Kenya. The British government renamed British East Africa as Kenya and made the territory a crown colony. The coastal strip of the colony, leased from the Sultan of Zanzibar in 1887, became known as the Kenya Protectorate. U.S.-Siamese Treaty on Extraterritorial Rights The U.S. and Siamese governments signed a treaty whereby the United States gave up any extra-territorial rights in Siam and granted the Siamese government tariff autonomy. Conference on Passports and Customs Formalities The League of Nations hosted a conference in Paris to address the problems of passports and customs formalities for international travelers. Danzig Declared a Free State As provided in the Treaty of Versailles, Danzig became a Free State and placed under the protection of the League of Nations. Second International Passport Conference The League of Nations hosted a second conference in Geneva on passport standardization to promote international travel.